The Companion Carpet Bag Sew Along over on Mrs H's blog is well underway. If you haven't checked it out yet, head on over and see where we're at, and the awesome prizes up for grabs! I promised a quick piping tutorial, so here it is. I don't want to reinvent the wheel, so I'm including some really great piping tutorials as well. For the purposes of the Carpet Bag, you only need one small piece, so I'll show you that here. The tutorials I'm linking to show you how to make proper piping from bias binding (and how to make that too), which can be used to pipe a whole bag, or a larger, curved area. If you only need a small piece for a straight edge, you don't need to cut on the bias, which can save you some fabric. To start, you'll need cording; I like 5/32" cording, or even smaller. You'll also need a zipper foot or a piping foot. Wonder tape will help, but isn't necessary. Using zipper foot, baste cording in place, snug, but not too tight. Alicia from Swoon made a very thorough and great tutorial here. Crazy Little Projects has a quick and easy to understand tutorial here. Do you have a favourite piping tutorial or tip you'd like to share? Let me know in the comments. You know what I love? Fabric, friends, and coffee (plus my kids and all that good stuff, of course). So when my sewing friend Kelsey, a volunteer for Ryan's Case for Smiles, suggested we meet up for coffee to discuss this blog post, I thought it was a great idea. Kelsey shared with me her favourite quick method of making a pillowcase, and she talked about her experience with Ryan's Case for Smiles, formerly Conkerr Cancer. She told me about the heartfelt letters she receives, thanking the organization for the cheerful pillowcase that really made a difference. She also told me about the trips her and her mother took to the hospital, bringing fabric and machines along, and allowing the kids choose their own pillowcases to make with them. I want to help this great cause, so I'm going to show you a really quick way to make a case to donate. I'm also happy to report that one of my amazing sponsors, Daryl at Fabric Spark, has set up some specially priced kits to purchase and is offering a giveaway of a Tula Pink pillowcase kit! Giveaway is over; thank you for everyone who contributed! "Ryan’s Case for Smiles (formerly ConKerr Cancer) started when Cindy Kerr’s son was diagnosed with cancer in 2002 and she began making pillowcases to brighten up his hospital room and to put a smile on his face. He loved it and so she began making pillowcases for other children on the Oncology Unit at Children’s Hospital of Philadelphia. 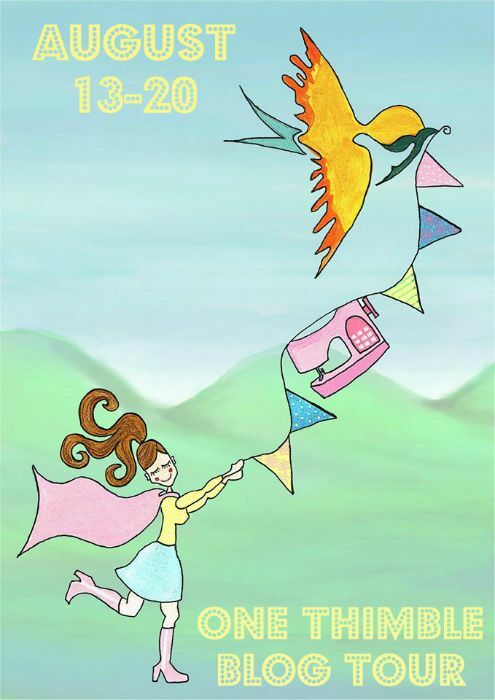 Since then the pillowcase project has grown in amazing ways.School groups, sewing circles, church groups, and fabric stores have all pitched in and are making pillow cases to comfort children in hospitals around the world. Thousands of Ryan’s Case for Smiles volunteers in over 120 cities dedicate themselves to brightening children’s lives through the simple act of sewing a bright, cheery pillowcase. As a result of their love and generosity, Ryan’s Case for Smiles has delivered more than 1,000,000 pillowcases in just seven years to 330 hospitals across the globe. In addition, Ryan’s Case for Smiles volunteers visit hospitals to sew with the children and their families, breaking up the monotony of long, frightening hospital stays. Ryan’s Case for Smiles has been able to make amazing progress towards fulfilling our goal of making hospital stays as pleasant as possible for chronically ill children and their parents. A simple pillowcase means so much to a child while they’re in the hospital and away from home. It helps cheer them up, gives them something soft to snuggle, reminds them of the comforts of home, helps calm their fears and brightens up their hospital room. Simultaneously the pillowcase project has fostered a spirit of community and volunteer service in communities across the world. Unfortunately there are always new little patients who need our love and support, and we must continue our efforts to help brighten patients’ lives and raise awareness about childhood cancer and other childhood illnesses. Information on how you can help Ryan’s Case for Smiles and help kids feel better so they can heal better can be found at www.caseforsmiles.org"
This super quick tutorial may be a new fave! Use it to make some for charity, but for your own kids too! You can make each pillowcase with just one yard total of fabric! You'll need 26" x width of fabric for the main part of the pillowcase, and 10" x width of fabric for the side band of the pillowcase. I don't have a serger, so I used my overcast foot for this project. If you don't have either of those, a zigzag stitch will work in a pinch. Start by folding the 10" wide piece in half, wrong sides together, matching the long edges, and press. Now place the folded (narrower) strip, on top of the wider piece of fabric, matching the long edges, right sides together. Pin or clip in place and sew along that edge. Now fold in half, right sides together, matching selvage ends. You probably need to trim a small amount at this point, otherwise your selvage will show through. Leaving the folded end open (yellow in my example) sew up bottom and remaining side. Turn right side out, and you're done! Kelsey tells me each and every case is appreciated, so if you can send 5, 10, or 1, they all count, and truly make a difference. Do you have friends that sew? Why not get together and challenge yourselves to see how many you can make? My personal goal is for this post to generate 100 cases. Can we do it?! The giveaway will be a challenge: each pillowcase sent to Kelsey as a result of this blog post will count as an entry to win a Tula Pink Pillowcase Kit from Fabric Spark, so the more you sew, the better your chances! Be sure to let Kelsey know I sent you, so she can include your cases toward the giveaway. You will have until September 30, 2015 to get your cases to her to be entered. Also make sure to leave her your contact info. I'll announce progress and the winner of the kit on my facebook page, so be sure to follow me there to keep in touch. Update: The Giveaway is over, but pillowcases are always welcomed. I've seen a lot of posts lately from other crafters and sewists about trying new things, so when this opportunity came up, I decided to go for it! I'm joining Pattern Revolution for the One Thimble blog tour. I made some hats! They aren't even remotely close to bags, and this pattern I'm sharing with you today was easy peasy, even for a bag-maker like me. 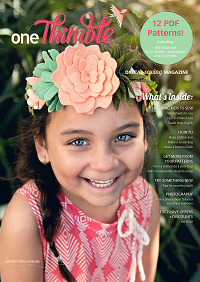 I'm also really excited to tell you about One Thimble, a Sewing Ezine, loaded with PDF patterns, tips, and articles. 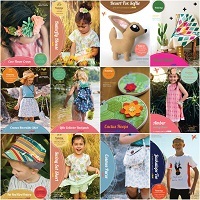 This latest issue includes 12 PDFs for a variety of patterns, including accessories, clothes for kids and a few extras. I got to try out the Fat Red Bird Fedora. It's so cute, and comes in all sizes, from infant to adult! I loved it so much I made 3! The PDF was easy to print, assemble and cut. There were clear photos at each step, plus clear diagrams, and I found the instructions very easy to understand. I love that there is no hand-sewing or binding finish to this hat, so you could make it reversible as well. I really loved the layout of the pattern, it was very visually appealing, plus Red Hot Tips throughout were helpful. I wasn't familiar with the interfacing brand mentioned, so I used what I figured were Pellon alternatives based on a couple quick searches with google (Shapeflex, Craft Fuse and Thermolam), and was really pleased with the results. I'm also quite possibly the world's slowest sewist, but I managed to get each of these sewn up really quickly, so I imagine anyone with a normal pace can get one done in under an hour start to finish. My youngest preferred to wear his as a bucket hat, which I think makes this pattern that much more versatile, like 2 hats in one. I also had a bit of fun with trying out a couple different coordinates for one hat. I picked up a twill remnant at my local fabric store and it paired so nicely with my designer cottons. The only thing I changed was the way the lines are added on the brim at the final step. I did spiral for my first one (pictured on the left below), but preferred concentric circles of stitching instead. Pictured are a Medium (left) and Large (right). Use the sizing chart as a guide, and make sure to measure if you're not sure. My 3 year old has a big head! I couldn't help but to get an action shot at the beach since these Robert Kaufman 'Message in a Bottle' prints are all about the ocean. 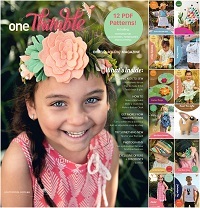 Hop on the tour to see some of the other great patterns in this issue! Large Companion Carpet Bag with handles from a thrift store bag. Large Companion Carpet Bag with premade handles. 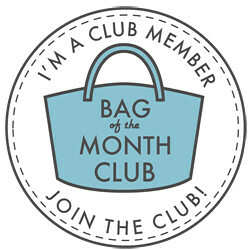 You may remember this bag I made as part of the Bag of the Month Club. It's the Companion Carpet Bag from Sewing Patterns by Mrs H, and Mrs H has asked me over to her blog for a sew-along! Whether you 've been waiting for an excuse to make one, or you've made it before, we're happy to have you join us! If you still need the pattern, you can save 10% with code CCBAGSAL, and as a bonus, you actually save 10% off everything in your cart, not just the carpet bag, so if you've been eyeing up some other Mrs. H patterns, now's your chance to pick them up. You can get the pattern here. The Sew-Along will take place over on Mrs H's blog, and will start August 16, and run each Sunday until the end of August. You'll have until October 1st to finish your bag and submit a picture to enter for a prize. Over here on my blog, you'll be able to find tutorials related to making this bag, like making your own handles. This pattern calls for a metal frame with a specific hinge, which you can find at Emmaline Bags (Canada and US) or Bobbin Girl (UK). I really recommend sticking to this specific frame, because the hinge is closed and finger-friendly. It comes in 2 sizes, and the pattern also offers a small and large bag. So go pick up your pattern and order your supplies, and I'll meet you over at Samantha's place on August 16th. If your frame doesn't come right away, don't worry, it's literally the last step of the bag, so we won't need it for a while yet. You'll also need some handles, which you can make, buy, or salvage from another bag (read about that in this post). Again, you won't need the handles for a bit yet, so don't fret about them too much for now. Here's my pile of supplies waiting to be made into a small Companion Carpet Bag. The best part about Sew-alongs is seeing all the different finished bags at the end. There were some really beautiful Super Totes made this time around! I've shared a few above, they are made by: (clockwise from top left) Crystal of Cloth Albatross, Jackie of Beauty out of Dust, Kristy ofRock Baby Scissors, Wendy of w.d. Handbags, and Jenny. Maxine did a great job on hers too! It's all ready for a day at the beach! Courtney also did an amazing job, using Cotton + Steel from 3 different lines that match beautifully. Courtney also happens to be the random winner for the prize of any two Noodlehead PDF patterns! She chose the Divided Basket and the Caravan Tote + Pouch; great choices Courtney! Prizes are done, but you can still join in the fun! The Super Tote pattern is still discounted with code STSAL, valid until August 31, 2015. If you like Noodlehead patterns, you'll love Anna Graham's new book, Handmade Style: 23 Must-Have Basics to Stitch, Use, and Wear, now available. I really hope you've enjoyed this Sew-Along. I have another one coming up soon, but first, expect to see something completely different from me! Hint: it's NOT a bag! I'm also working on some tutorials to share with you soon. If there's something you're looking for, let me know in the comments, or send me a message.